Save Paper, Save Trees! Protect Our forests!!! This LCD Writing Tablet can be erased over 100,000 times over the life of the tablet, which means you can save 3 trees. It is used in many occasions like in the home, school, office for note taking, memo, reminding, massage, draft, scrawl and etc. A great tool for kids, students, business men, designers, office family memo, and deaf-mute people. Extremely a good gift for kids to spread out their creative ideas! Using high technology flexible liquid crystal technology, depends on the pressure sensing to display text, pictures and graphics. Pen - Writing or drawing with the plastics stylus or other suitable instrument - even your finger! Erase Button - It can erased over 100,000 times. Erase Lock - It avoid accidentally erased while you writing. Compact and lightweight, very easy to carry and store. Small parts included, not suitable for kids under 3 years old. Screen Lock & Erase Key: Built in a screen lock key to avoid accidentally erased while you writing. Don't worry about losing the important image or data. Slide the lock button to the right to lock the creative content,to avoid accidentally erased while you writing,keep your important image/message. One button erase the contents easily and quickly by the erase button. Multi-Functions: The electronic writing tablet is engineered to feel like writing with pen on paper. It's suit for writing, drawing, doodling, reminding, draft, office memo board and as a communication tool. Ideal tool for kids, students, business men, designers and so on. Environmentally and Eye-friendly: Electronics writing tablet with a super-wear stylus, easy storage, with the use of anti-loss prevention. Writing or drawing with the included plastic stylus or any other suitable hard instrument - even your finger! Saving pencils and papers. No more worry about wasting paper. LCD screen, no radiation, no glare, protect your eyes. The LCD writing tablet is the upgrate version. The writing is brighter than the old version 8.5-inch LCD Writing tablet. Portable & Lightweight: The writing board frame which is made from durable ABS plastic, weights only 109g. It's easy to take in a purse, scheduler, briefcase or backpack anytime and anywhere. 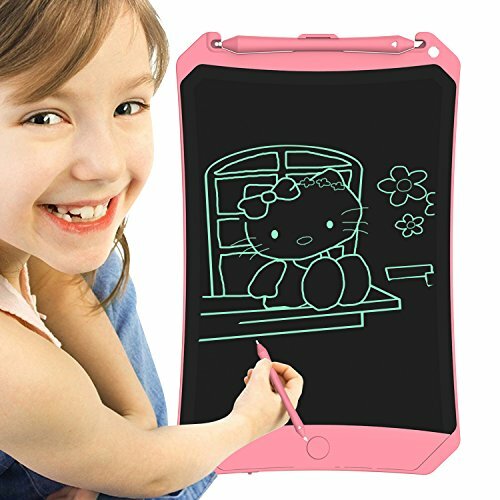 Best Gift for Kids and Adults: High quality LCD screen enables the lines be smoother and clearer. Exercise children's drawing and writing skills. And a good helper for work. Pls don't hesitate to contact us if you have any questions.